I have had my Olympus OM-1 35mm camera since the 1970s, but photography for me came later when two very colorful characters entered my life. Taking pictures of my children led me to fall in love with the medium. I put a darkroom in my basement, got over my fear of basements, and spent many nights down there - developer trays to the right of me - baby monitor to the left. 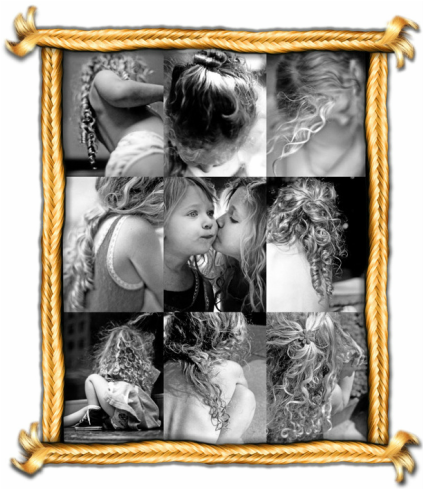 Becoming a children's book writer was never the plan, but a print series of my daughter's long locks sparked my imagination. As I went through my many negatives, SHE YELLED. I SCREAMED...SHE PULLED MY HAIR! found its beginning, middle and end. I can't tell you how much I enjoy the process of taking my images and creating stories around them - all while giving folks a glimpse into the wonderful world of black-and-white photography. Photographic illustration has been an eye-opening experience for me. In joining the genre, I have come to discover some wonderful examples of photographically-illustrated children's books - unquestionably worthy of exploration. Follow my blog to discover some back-in-the day and current photographically-illustrated picture books , and please share your finds with me! I am also currently at work on something completely different. For now, though, I hope you will enjoy She Yelled. I Screamed...She Pulled my Hair!